The Center for American Progress, reported the Texas Tribune, has issued a report on a theme Grits has frequently harped on: The economic absurdity of calls for mass deportation of undocumented immigrants. 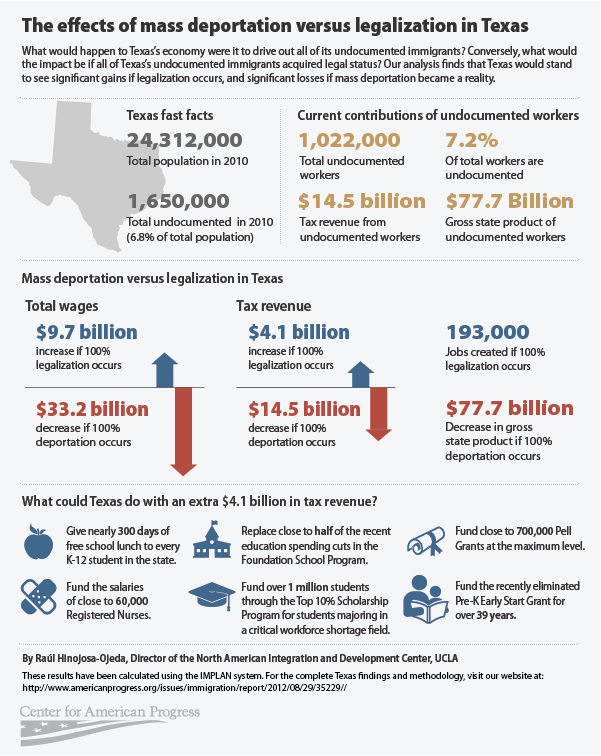 According to the CAP analysis, "if as few as 15 percent of Texans living in the state illegally were removed at once, it would mean an annual $11.7 billion loss for Texas’ gross state product, increasing to more than $77 billion if all 1.65 million estimated illegal immigrants were removed from the state." Further, "The study also estimates that removing the illegal immigrants would result in a loss of about $14.5 billion in annual tax revenue for the state, about 7.6 percent of the total tax revenue." Thank heavens somebody crunched those numbers. As Grits wrote back in April, "other common words for immigrants, unauthorized or not, are 'customers,' 'employees,' even 'small business owners,' and for the most part the Texas business community, at least, believes we need more of all of those. Imagine the economic impact if tomorrow all the nativists' fantasies were fulfilled and Texas suddenly had 1.6 million fewer consumers." Now we don't have to imagine: The Center for American Progress has calculated it. See an infographic giving more Texas-specific data below the jump. You really shouldn't depend upon a liberal think tank for forecasting the results of political issues. When anti-illegal laws were passed in Oklahoma, estimates of the number of illegals leaving the state were as high as 100,000. It certainly didn't seem to affect the economy there, and I do own a farm and spend time there. Heck, my OK state taxes actually went down that next year. Maybe we shouldn't depend upon an anonymous commentor with a different view, either. I think that the chart needs to factor in the number of illegal children in our public schools participating in free and reduced lunches, and adding ESL staff. I think the monies lost in the ER's, as well as those on welfare rolls need to be factored as well. It is a harsh reality we face as Americans as a result of not securing our border. We must secure the border first before we try and analyze what solutions should or could work. No one wishes for children that only know the US sent away...and living so close to Juarez makes me concerned about sending people back to the war zone...but securing the border would afford us an opportunity to begin resolving these issues. Thanks Texas Tribune, you liberal think tank ;) You Rock! Humble Wife, what do you mean by "securing our border"? And by "harsh reality we face"? Really, what does that mean? Most, if not all, of the "illegals" I know in the smallish, central Texas town near me, are hard, law abiding workers with whom a lot of us could not do without because we cannot find local Anglos or local, American Hispanics who are interested in working for just slightly more than minimum wage, no health care, no paid vacations, and no retirement account. Have you any knowledge of the number of "illegal children" in the school lunch program near you? Do you really know how that number compares with "legal" children? Do you know where the money, or the food comes from? Do you know that those childre are really "illegal"? And how many are on "welfare"? My point is that there is a whole lot dis- and mis-information out there about this problem, a whole lot of ignorance of the facts, and a whole lot of fear-mongering. I agree with you that all those things you mentioned should be "factored in," but I have to wonder, honestly, if you could be satisfied with the outcome of that factoring-in. The neat things about Grits for Breakfast as a blog is that its political philosophy is so hard to pigeonhole: center right, center left,far left, libertarian,civil liberties, or just nutso? But seriously, if I came on here and quoted as my sources the "Tea Party Patriots" and the "National Rifle Association", I would expect to be hooted off the site and rightly so. As a conservative, it debases the reputation of this blog when the Texas Tribune, and even worse, the odious Center for American Progress are cited as reliable information sources. The Tribune at least has some credibility, but the CAP has none. Mass deportation may be a silly nonstarter but failure to secure the borders should not be condoned by either party, though in practice it is done by both. George W. Bush seemed to think that all illegal immigrants were either ranch workers, landscapers, or honest restaurant bus boys. 'Taint necessarily so. Prison facilities house many convicted noncitizens, regardless of what political cover stories are advanced to the contrary. Those who claim that illegal immigrants are an economic boon and are universally law-abiding are just too far removed from the situation on the ground, and politely put, don't know what they are talking about. The FIRST step should be to lock the borders PERIOD! Then you can sit back and see what you have to deal with inside and how you want to go about dealing with it. to do it any other way is just retarded. would be like bailing out the boat BEFORE you fix the hole in the bottom! Rod, are you serious? How much thought have you given this? Do you really mean lock the borders so no one, no one at all, can enter and no American citizen can leave? Or are you just talking about locking the borders to people coming across from the south? Have you any idea of what it would cost to prevent people from walking across the US Mexico border? I don't, but I do know that border to be very very long and extremely rugged and remote in most places. So, give us an idea of the cost. Maybe it would work, economically. And let us know if you want your taxes to go up to finance the effort. Jeeze. The lack of clear thinking and the amount of blind wishfulness on this subject are just overwhelming. And the "do nothing" approach to border security accepted by most liberals is just as bewildering, Doran. tExcellent points Prison Doc. The fact is by not controlling our border and selecting who gets to come in we let in the criminals as well as the hard working majority. Doran likes to play that game we have all become too far familiar with in the last 20 years and accuse people who want a secure border of ignorance and fear mongering but one only has to have a memory and read the paper to see the constant stream of crime committed by illegals. Exodus 22:21 "Do not mistreat an alien or oppress him, for you were aliens in Egypt. Methinks if you criminalize being here illegalally, you have a bunch of criminals here. They are already over the "legal" line, and don't fuss over the semantics of say, theft or dealing especially when they are hungry. There is no clear path to be right in the eyes of the government, so WTF! Also if the politicians can not turn around the debt, this debate will be moot and Mexico will be looking to keep gringos out. Bernake is like a 14 year old in charge of the bomb squad. So Hyperbole, does the bible say to break the law as well? It’s nice that you appointed yourself the arbiter of biblical interpretation upon this subject. So when you’re not busy separating the real Christians from the false ones do you ever question how far your superior morality extends? If the moral Christian act is to welcome all should we not open our borders to everyone? We could have 50 million more people here by next year. Perhaps quite a few more. Prison Doc, glad you find the blog entertaining. In this case my stance stems basically from my support of free markets. I'm just not so narrow-minded or xenophobic to think that philosophy should exclude labor markets. Also, no one ever said illegal immigrants are "universally law abiding" - that's a BS straw man - but it's a fact that they commit crimes at disproportionally MUCH lower rates than US citizens by any measure, as this blog has documented many times. Rodsmith (and others) say "The FIRST step should be to lock the borders PERIOD!" That's just silliness, and fails to understand Border Economics 101. Also, be they liberals, libertarians or business interests, I've never heard anyone on the reform side advocate a "do nothing" approach but instead push for amnesty and comprehensive immigration reform. The BS about "secure the borders first" is really the "do nothing" approach because it ignores the problem of the millions already here by saying it can't be addressed until some nativist fantasy is in full effect that even Prison Doc et. al. admit is a "silly nonstarter." Finally, whatever you think about the CAP, the Republican Texas Comptroller a few years back similarly calculated that the economic benefits from illegal immigrants were greater than the costs, but the same flat-earth whackos wouldn't take her word for it, either. That's a function of ideological blinders. Logic, facts and for that matter basic mathematics are on the side of those favoring comprehensive immigration reform. Finally, @ CraigO, re: "does the bible say to break the law as well?" See Acts 5:29 where St. Peter, justifying a prison break, advised that "We ought to obey God rather than men," then apply that sentiment to the mandate above from Exodus. Certainly there's a strong case to be made. @ craig0 sorry no interpretation is needed. Maybe you would be so kind as to tell us just what exactly God means when he says do not oppress, vex, or harass the strangers among you, and mind you the hebrews were strangers in the land of Egypt for 430 years. LOL doran what i'm talking about when i say locking the border. Is controling who comes in and out. Yhe United Nations treaties we have signed give every national citizen the right to come and go from their own country. As long as you were legal. Go for it. Just like any other country. Even mexico exercises that option on it's SOUTHERN border. As for securing it. it's not hard. WE have a million troops around the world costing us money. Close those bases return them to their own countries. Then park those troops in new bases on OUR OWN Border! We'd accomplsih two things. We'd take control of our own border and we'd suddenly be spending that trillion dollars in our OWN DAMN country instead of every other country on earth! a WIN - WIN as it were! Shall I interpret these arguments from ya’ll as support for a theocracy? If someone breaks into your house and robs you it would be ok if they did it because they are hungry? How about if a shanty town is developed in your back yard? The idea that people, who support enforcement of the border AND for the US to continue to be the nation that accepts more immigrants than anywhere, are somehow xenophobic nativistis is patently silly. I will inform my friends from Eastern Europe and China, who become rather angry that they followed the rules to become citizens and others ignore them, that they are nativist. I also firmly reject your argument about the economics. Sure the numbers probably do show a significant economic advantage to big business but those qualities don’t extend to we lesser classes. Your side piously lectures about anyone anybody disagreeing with you as flat earthers but seem to conviently ignore basic economics 101. A constant uncontrolled influx of workers for jobs at the bottom of the socio-economic ladder does indeed benefit big business, but it creates significant downward pressure on wages while increasing competition for those positions. I find myself having vastly greater empathy for the blue collar worker than I do for the fat cats. @ hyperqube As an agnostic I really do little reading and interpretation of the bible, but as an historian I do seem to recall a few instances where people fought wars over that interpretation and often times they had your faith and conviction in their ultimate interpretive superiority. I myself, do not wish to live in a theocracy. Let's keep the Bible out of it. As Shakespeare wrote, "The Devil can quote scripture for his own ends" (Merchant of Venice, Act III) and that's what we have going on in this thread. I can quote and discuss Bible with any of you but feel that it is best left to theological discussions! @Prisondoc, i'll leave you to your delusions. CraigO, I'd suggest you only interpret my response as an answer to your specific question. Otherwise, as per Prison Doc's comments, I don't find the biblical arguments nearly as compelling as the economic ones. And it's not a question of blue collar vs. "fat cats": Reducing domestic demand reduces jobs for the blue collar folks, too. Just because you don't understand why doesn't mean it's not true. Rod, you don't have a clue. All the soldiers in the country won't let you search every vehicle crossing the bridges. Meanwhile, about half of all "illegal immigrants" enter the country legally and overstay their visas. What will the soldiers do to solve that? At some point, reality must intervene in these discussions. "they [illegal aliens] commit crimes at disproportionally MUCH lower rates than US citizens by any measure, as this blog has documented many times." Really? How would you know unless they are caught? Illegal aliens that enter this country with no identity or paper trail are literally invisible to authorities. And, how many illegals commit petty crimes and traffic violations and are just released because (as my local law enforcement puts it) they can't really do anything with them anyway but turn them loose? Although anecdotal, the two most heinous crimes I have ever personally known were committed by illegal aliens. Of course, law enforcement would not have known they were committed by illegals had they not been caught. Is the issue that these people have the nerve to enter America and stay there without going through the "proper" channels (which most Americans have no idea about anyway and don't know how difficult it is even if you ARE a law abiding citizen and try and do it the right way), or is it that some people with different coloured skin appear to be getting free school meals for their kids and free housing and free healthcare (which I didn't think existed in America)? If it is the first: if you can get them to contribute through taxation, then does it really matter? If it's the second: don't give them the means to get free anything. If they can't afford to feed and house their families or themselves, it will become less attractive for them to enter the country in the first place. Just can't learn can we? Anyone on here fly? Back in the 60's a local company in my hometown used to radio advertise "Steel imports steal jobs." Nothings changed today. For a long time we have become dependent on something foreign, whether it be manufactured or in this case, labor provided by illegal immigration. Spare me the rhetoric "well they only work jobs that Americans won't." Now what do we do. How do we wean ourselves on this dependency. Wake up America! who abandoned anything? You feel that your opinion deserves a response? Deserve? LOL. That sounds like a response I would expect from a 12 year old. Are you really having that difficult a time following the thread of this conversation? For the record, I don’t think anyone “deserves” to read your comments, but of course I am a humanitarian. "the biblical quotes are used when it suits your point and quickly abandoned when they seem less useful"
Craig, you asked a specific question unrelated to anything I wrote in the post and even though it was off-topic, I responded. I didn't abandon anything. If you don't want questions answered, don't ask them. Otherwise, we simply disagree on the other points and I've explained why. Since Henry Ford American business has understood that buoyed demand benefits the economy, or as John Kennedy put it, a rising tide lifts all ships. Texas arguably has the strongest economy in the nation (though in recent months California has exceeded us in job growth). Immigration, foreign and domestic, legal and otherwise, has been a tremendous catalyst for that growth (IMO the most important part besides the oil/fracking boom). You disagree based on an ideology that views economics as a zero-sum game. For my part, I simply do not share that view and the data back me up. 7:35 asks on immigrants and crime, "How would you know unless they are caught?" To be fair, though, we also don't know how many crimes are committed by citizens who are never caught. All crime data is merely a sample - like a pollsters sample - of the total universe of crime. However, especially in jurisdictions (like most of Texas) which have implemented the so-called Secure Communities program, the data do accurately capture illegal immigrants' proportion within that sample, and my statement about immigrants committing fewer crimes is well-established. You can cite anecdotes or pretend "most heinous crimes I have ever personally known" were committed by illegal immigrants (I forget, was James Holmes of the Dark Knight massacre an undocumented Mexican? ), but you won't ever be able to back up your claims with actual data because the facts simply disagree with you. "To be fair, though, we also don't know how many crimes are committed by citizens who are never caught. All crime data is merely a sample - like a pollsters sample - of the total universe of crime." But, since legal citizens do have an identity and paper trail, and don't fly unknown under the radar like an illegal alien does, they are easier to catch in regard to many types of crimes. In regard to the two most heinous crimes I ever personally knew of, the perpetrating illegal aliens were literally on their way back to Mexico and safety. I consider it a miracle they were even caught. "Just can't learn can we? Anyone on here fly?" As I remember, I had to jump through hoops to prove I was a US citizen to get my pilots license! When is the fed going to stop looking the other way on this?